Flying with a baby is one of the biggest reasons that families with youngsters choose to stay home rather than traveling abroad. The thought of air travel with kids can be intimidating. You might be concerned about being “that parent with the screaming child”, losing your child in a busy airport, dealing with security while wrestling with a toddler and a diaper bag, or any number of other very valid concerns. It’s true that air travel with children requires more preparation than going by yourself or with your partner, but it need not be a nightmare. With over 50 flights with children under 5 years old under our belts, we thought we might have a little experience to help those thinking about flying with their kids. Here are our thoughts on what you need to know before flying with a baby. Make sure you plan your route to the airport accordingly. Take into consideration traffic and construction delays and figure out if you are arriving by taxi, Uber, train or car. Most national flights require you to be at the airport at least an hour before your flight while international flights require at least two hours. When you’re traveling with children, it’s always good to leave yourself some extra time in case of delays checking in, or emergency diaper changes. If you have a lap-child then the child is usually entitled to a carry-on bag in addition to the guardians carry-on. Most airlines also allow you to bring a stroller through security and have it be checked in right at the gate (often called a gate-check). If you choose this as an option of transporting your child through the airport, make sure you let the airline know at check-in so that they can give you the gate-check tag for your stroller. A stroller is usually a complimentary check-in on most airlines. If your child has an item that they can’t live without (in our case, D absolutely must have a soft blanket with him to relax), then a flight is not the time to leave that at home. Whether it’s a stuffy, a blanket or a favorite book, make sure it’s available in your carry on for when your child needs it. Don’t let what happened to us, happen to you. During our 15 hour flight from Toronto to Jordan, D got hit with a bad case of the runs. We watched desperately as our once towering stack of diapers dwindled to naught. Finally, two hours before our flight landed in Amman, we were cleaned out and praying to the poop gods to give us a break. For your flight, pack double the number of diapers you would expect. Prepare for delays, weather cancellations, and any other wrench that can be thrown at you. Don’t forget to pack an extra set of clothes and a couple of plastic bags in case of “accidents”. Keep in mind when booking your seats, children are not allowed in the exit row of an airplane. Many airlines also have policies limiting one infant per accompanying adult (16 years of age or older). Rules on flights with children vary by airline and are also different for domestic, international and trans-continental flights. When flying with children under two years of age, you have the option to board them as a lap child. A lap child often allows you to book the child at minimal or no additional charge (depending on the airline). To save on costs, we always chose to carry our children as lap children during our flights, including our 15-hour flight from Toronto to Jordan. Having a lap child means that you will require an extra seatbelt for international flights and you must hold your child, with the seatbelt on when the seatbelt indicator is on in the plane. Because lap children have a different ticket than others on the flight, most automatic ticket booths will not allow you to get your child’s ticket from them. Instead, you will need to go directly to the counter and speak with an attendant. If you are willing to spend the money to fly in comfort, purchasing a seat for your child can be a great way to improve the quality of your time onboard your flight. Your child will need to be secured in a proper child restraint, such as a car seat, during times that the seat-belt indicator is on. Airplanes don’t have UAS systems, so you will need to be familiar with how to install your airline approved car seat. Some airlines allow parents of young infants to book a bunker bassinet, which is a small cot or bed that attaches to the wall of an airplanes bunker divider. These can be a huge score if your airline offers them, but you need to book them very early and often need to contact the airline directly to ensure that it is an option. Whenever possible, target non-stop flights. Limiting the boarding/de-boarding time as well as time spent organizing your family and packing/unpacking will significantly reduce the stress of your travel experience. If you have the opportunity, choose an aisle seat. Children need to use the bathroom, a lot. Plus they like to get up and walk around the plane and introduce themselves to absolutely everyone on the flight. Choosing an aisle seat will help maintain your sanity as well as that of anyone who you’re seated with. The standard for liquid allowance on a flight is that no item can contain more than 100 ml of liquid in your carry-on baggage. These numbers, however, change when you are flying with children. Parents are allowed to bring enough formula, breast milk, and juice to keep your child nourished during your flight. There have been instances where parents have attempted to carry-on significant amounts of these liquids, either from pumping while on business trips, or carrying on enough milk or formula for the child’s entire week-long travel and have been forced to dump the contents. The rules around amounts vary by airline, so it is best to bring what you need for the flight, plus a little extra in case of delays. While this isn’t an issue with a lap-child, anytime a child is booked in their own seat, many airlines have the option of separating a parent from their child during a flight. We think that this is a ridiculous policy. Some airlines are working to amend these policies, but to avoid any unpleasant surprises, speak with the airline ahead of time. 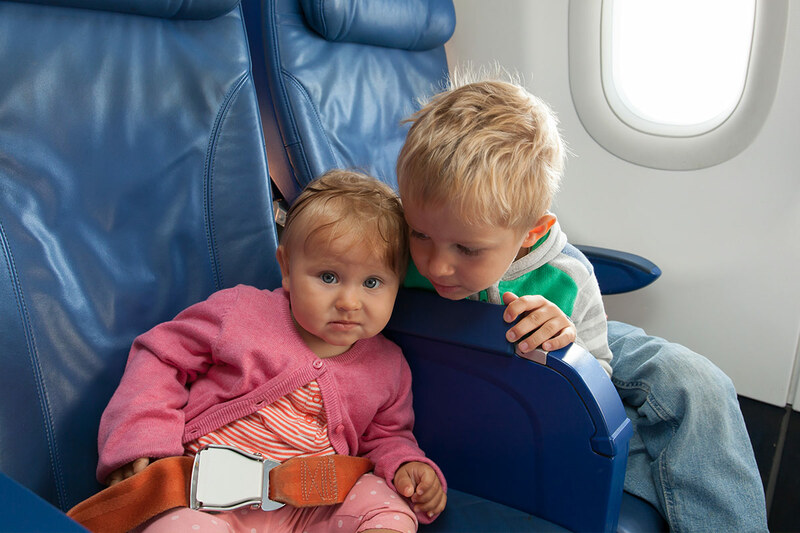 There may be additional fees involved to ensure that you are placed with your child during the flight. 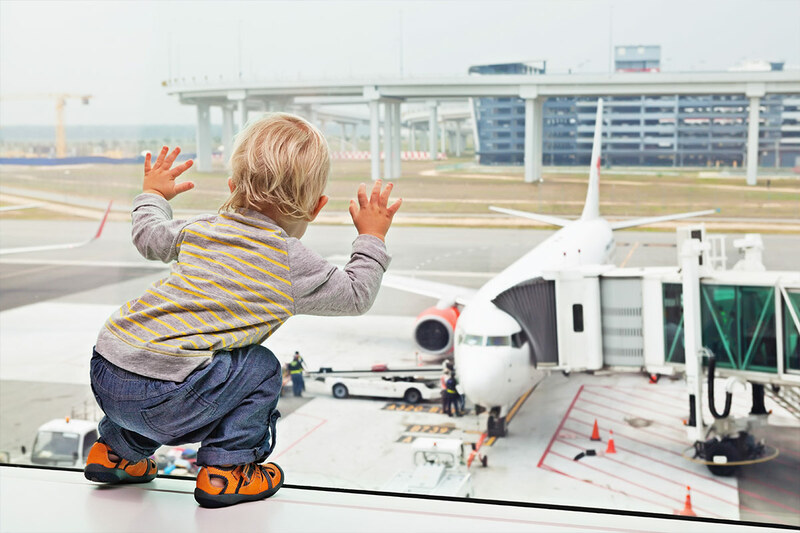 Airports can be busy places, so arriving early and getting a spot close to the counter and near a window can help you get settled and entertain the kids all at once. Make sure to pack a few toys or games that can be quickly packed up once the call-to-board occurs. If you haven’t packed any food for the flight, after check-in is also a great time to make any purchases of snacks or drinks for the flight. Airline food is rarely more than edible, so having some of your own munchies will help keep children’s hanger (anger caused by hunger) at bay. Security is always a big what-if when traveling, and with children, it’s no different. Juggling your bags and your baby makes the process a little more complicated than going through alone or with your partner. Make sure you have slip-on shoes and all your accessories, belts, change and phone are packed away in your carry-on before you join the security line in order to help simplify the process. Children below the walking age are able to be carried through the scanners by their guardian. Once children are of walking age, they will usually need to go through themselves, either before or after their guardian. If your child is comfortable going ahead of you, a security agent will be waiting on the other side of the scanner to keep them from running off. If you need to go ahead of your child, you can ask an agent to wait with your child so they can walk through to you on the other side. Often, but not always, airlines give the option to those traveling with young children (generally considered those under the age of 5) to board early, just after those in the first-class/business-class seats. While we generally opt to board at the earliest possible moment in order to secure much sought after overhead bin space and get the children settled while there is relatively low traffic through the aisles, if you have an ‘energetic’ child, you may want to delay boarding as long as possible in order to give them a chance to burn off some energy before trapping them in a tin-can. So you’ve got your flights booked, you’ve checked in, made it through security and boarded the airplane. This, for me, is where I consider the trip to have “officially” begun! Here are a few tricks for making the best of your time in a flying canister. When you fly with children, there are a few things that the flight attendants will brief you on at the beginning of the flight. These usually include seatbelt/carrying instructions and tips on how to make the flight more comfortable for everyone on board. If you have a long flight, a few soft cover storybooks are great to bring. small puppets are also a great way to bring some smiles to your little one as you cruise through the air. Children can suffer from ear pain during flights due to their inability to make their ears pop during pressure changes. Having a bottle, soother or breastfeeding your child during take-off and landing can help your child’s ears pop by inducing a sucking motion. We always travel with the motto “hope for the best, but expect the worst”. Airlines are generally quite good at helping parents through the flying process, but anyone can have a bad day, and rules are rarely in place to help the customer. Don’t be afraid to ask for help, but don’t be surprised if you don’t get it. Most passenger airplanes have at least one bathroom on the flight with a fold-down change table on it. It’s snug in there without the change table down, and it’s even cozier with two bodies and a change table taking up space, but at least you have a flat spot to work with. On longer flights you will likely be asked to place any diapers into a supplied plastic bag to ensure a more pleasant atmosphere for everyone onboard. Flying with a baby certainly offers its fair share of challenges, but if you plan ahead and give yourself lots of time, much of the pressure can be lessened. Don’t burden yourself with the extra stress of worry, and plan ahead to allow you take each moment in stride. Yes your child may cry or scream, or maybe they don’t. Maybe another passenger gives you a look, or maybe they help you lift your bags when you’re struggling. Either way, hope for the best, but expect the worse and focus on you, your baby and your upcoming adventure. Are you a parent who has flown with a baby? Do you have tips, tricks or hacks that we may have missed? We would love to hear your thoughts in the comments section below! Great tips! I have been very surprised by how many times I have seen parents and children separated on flights and other passengers have been unwilling to switch! I know! It’s one of the worst oversights in the airline industry! I do not have any children, but I did always wonder if tickets had to be purchased for a child. Now I know the difference between a lap child ticket and actually purchasing a seat ticket. This article is so true! I have flown with a baby before and I agree with all of it! The best tip you said was to bring an extra outfit. I am not sure why but you always end up needing it at some point in the trip! Great tips! Hopefully this article will help not only parents but everyone else on the plane understand baby-flying better! Also snacks are essential for me so I don’t cry too, hehe. Great tips big Kev. I don’t think anything can prepare you for the first time you fly with little kids. I know for my wife she was a bundle of nerves and worry as it approached. Like most things though it is easier than it seems. Such a detailed and great article full of tips how to fly with a baby and what to prepare and how to have a great flight. Great guide. Preparation is everything when flying with kids. Although we aren’t looking forward to flying with a 1 & 3 year old soon lol fingers crossed it goes smoothly. Our youngest doesn’t stop already at 11 months! LOL, they only get more rambunctious as they grow! Good luck with your flight! Let me be totally honest and say that I recently am thinking of holding off having kids so I can travel and explore more. I don’t think at this point in my life I would be able to handle a baby at home let alone flying! These are great tips that I need to pass on to my friends though! I don’t have kids myself, but I always give kudos to parents traveling with kids. It seems like no easy task, but these sound like some great tips to make it go a little more smoother. I also always try to not be annoyed on flights because I know that someday it could very well be my toddler spilling cheerios everywhere and having an all out tantrum lol. I don’t have children but this is certainly a useful article for parents! I’ve been the victim of more than my fair share of noisy babies, but it’s clear that preparation makes a world of difference! Great post! Great advice but man… that is a LOT OF WORK to flight with young ones. I would probably be in the camp who doesn’t go anywhere until the child is 4-5 years old. Can’t imagine running out of diapers on a long flight with your child having stomach issues… nightmare! This is a long time ago for us, but I think we’d have appreciated all this really useful, sensible advice back then! You should clarify in packing that extra clothes should be brought on board for BOTH the caregivers and the children!! Sometimes it is needed. And always have too much food. We thought flying first class would give us access to just about whatever we needed. When the child woke up hungry in the middle of the night, the only thing available was a frozen banana. Eeek! That’s such a great point! I’ve been on the receiving end of my fair share of messes as well! I’m surprised you were even allowed in first class with a baby, many airlines actually have age restrictions on first class and business class! Oh man – as great as these tips are, I’m grateful that we don’t travel with tots anymore. Of course traveling with teens has it’s own challenges, but flying is a breeze. Also, as far as I know there weren’t those cool bunker bassinets when my kids were little. Many airlines have improved their family-friendly reputations (at least that’s what I’m told). We learned about the bassinets too late to take advantage of them too, but with a little one, I imagine it would be a great way to travel. These are really great tips for parents. I imagine flying with a newborn must be one of the worst things a parent can go through! Imagine a baby crying all the way through a long haul flight… You can never be too careful! Babies are better travelers than most people give them credit for. It certainly does help to be prepared! Flying without baby can be already stressful so I could imagine why these things need to learn and to prepare as you go with one. Detailed tips! So many parents are petrified of flying with their child. There is no doubt it requires some planning, but the rewards are incredible! Oh my! This blog post is so useful!! I love how easy it is too follow and read! Great tips that everyone with kids needs to read! This article is full of great tips everyone should know. All about preparation and time. Very helpful tips for parents! That is an impressive amount of flights in that period! All these tips are amazing we all sure appreciate all your experience and time to share this with us, thanks for this cool blog post mate! Thanks Nicolas, I’m glad to hear it’s helpful! Your photos are absolutely adorable. You are very brave. We didn’t take our first flight until our kids were six and three last December. It was a great experience (the pilot even let them sit in the cockpit and we got great pics! ), and we have another flight booked in June. Direct flights both times! Sounds like a great trip! It’s wonderful when your kids get a chance to experience the cockpit! Happy travels! Great post, I wish I had thought of all these things when my boys were little! The airlines who separate parents from their children drive me crazy. It’s unfair to everyone involved. I’m so happy this policy is now in the spotlight. This was such a good post. Although I don’t have children yet, I enjoy reading such stuff. I will all be helpful one day! Thanks for sharing! Great post! Very useful information. I don’t have children, but a friend of mine had a baby a few months ago, I will definitely send this article to her. She needs it. I’ve flown with a huge but still breastfeeding lap child on my own, from Uganda to Toronto and you know what save me? Flying with an African airline. We used Ethiopian. 80% of the passengers had kids (sometimes 3 or 4 of them), same with the crew. Kids, babies, noisy families are all super normal to everyone on board. If you’re tired or your kid is fussy, some one will come along and take him away for a bit. It’s like being in Africa right until you land at Pearson.The crew let the kids run around and enjoy themselves (Addis to Toronto is a 16 hour flight) and if they make noise, people laugh and enjoy it as well. One big happy family. This has not been my experience with European or Canadian carriers. Your tips are awesome. Your kids sure are lucky to be getting in all that travel when they’re young. Take care. That sounds like an incredible experience! It’s so great when both the staff and the passengers look at children as a joy rather than a burden. Thanks so much for sharing your story! Thanks for sharing. I can say from experience, that it can truly be a challenge traveling with little ones. I definitely “hope for the best, but prepare for the worst” Thanks for such a good list. These are pretty damn good tips for flying with babies. And they make sense, like choosing the aisle seat. Of course, when you have babies you tend to use the bathroom a lot, it would be so much hassle if you are sitting by the window. I’m not sure if I’m going to have a baby someday but when I do, and when we need to fly, I would take these useful information with me. This is a good read, since I’m planning to bring my family on a vacation that requires flying. I have a 2yr old sister and this is a perfect guide for flying with a baby. I just hope that she wouldn’t experience the ear pop. Which I normally experiencing every time I have a flight. 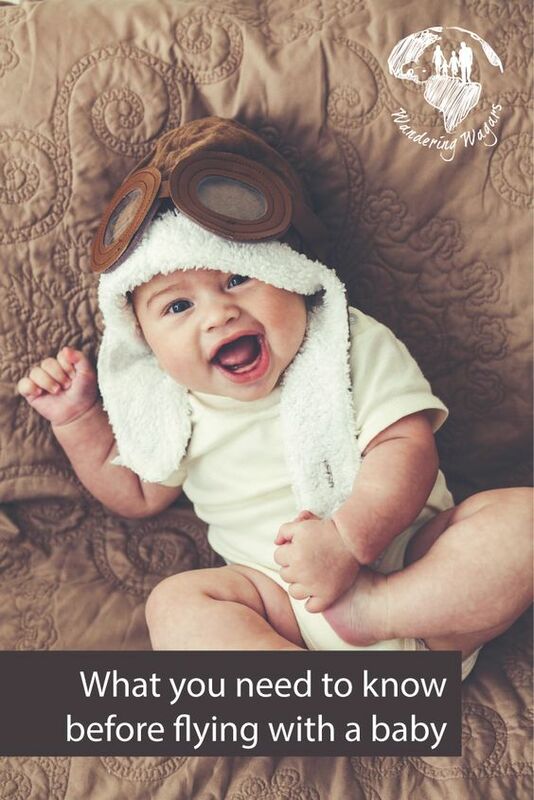 I wish everyone who boarded a plane with a baby would receive a copy of this! Its always frustrating to have crying babies and children wailing on the floor with their parents just ignoring them. Kudos to being considerate travellers! This is so so interesting to me. Even though I don’t have a child now, it’s great to hear that there is travel after birth :). I recently saw a facebook thread from an old work colleague talking about flying with a baby. It was fascinating to read people’s suggestions and comments. I had no idea that airlines would possibly seperate the parent and child either – that seems crazy. A lot of great suggestions here that I am sure many people will benefit. Great details and tips. It’s posts like these that will hopefully help to encourage families to just go for it and travel with babies. I know flying with our kids from the beginning has helped turn them into beautiful travelers! Thanks Kimberly! I sure hope that’s the case! Hi Cathy, These one’s aren’t ours, but most of the rest of our posts include photos of our little guys. Kid Carriers (Backpacks to carry your children) are a fantastic way of bringing them around in comfort. We used one for our kids and they loved it! This is such a comprehensive list! Will send it to my sister who’s flying with her baby. such an informative post ! Very valuable tips. 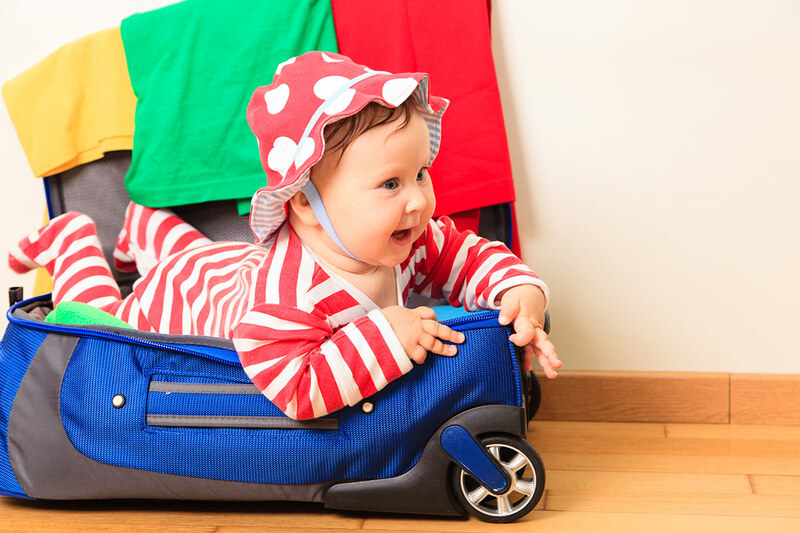 There is so much to consider and pack when travelling with lil ones.